SideKick Extended 6 is the easiest, yet most comprehensive side-chain compressor you could ever use. Get it right now at the exclusive promo price of only $19 during “Dynamics Crunch Month”. 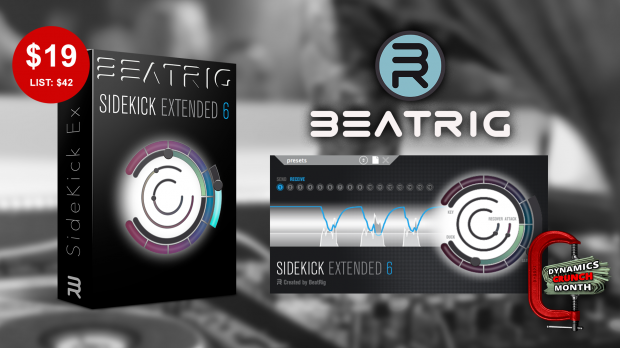 SideKick Extended 6 wil make you an expert in the art of side chaining compression and ducking. With Side chaining you change the volume from one sound by the volume of another sound. It is most commonly used to duck (bass) sounds on each kick punch. Creating room in your mix for maximum fatness. This entry was posted in DontCrack, Plug-ins, Promotions and tagged BeatRig, side chaining compression, side chaining ducking, side-chaining, SideKick Extended. Bookmark the permalink.